The purpose of this post is to thank the ABC Australia for removing a distressing, defamatory and derogatory ‘article’ written on The Drum (now closed) website by a person called Sunita Bose after I won on liability for defamation against Google Inc. Bose’s article was removed by the ABC lawyers and a correction was published as soon as I notified them. I thank the ABC Australia for their prompt and compassionate response. The removal was enacted to alleviate my distress and without any reference to liability. The ABC Australia took the right action. This week is critical for the future of free speech in Australia but, based on an obscure and chilling ruling last week, that future could be bleak. Speaking out online can make the powerless more powerful and, for so many of those people, the stakes couldn’t be higher. You may ask why, of all the worthy causes in the world, is intermediary liability – something that sounds so intensely boring – so critically important? The answer is that the internet is now the arena for almost all important social, political, and cultural debates. If we’re not allowed to even acknowledge certain problems online, we can’t ever start to change them. 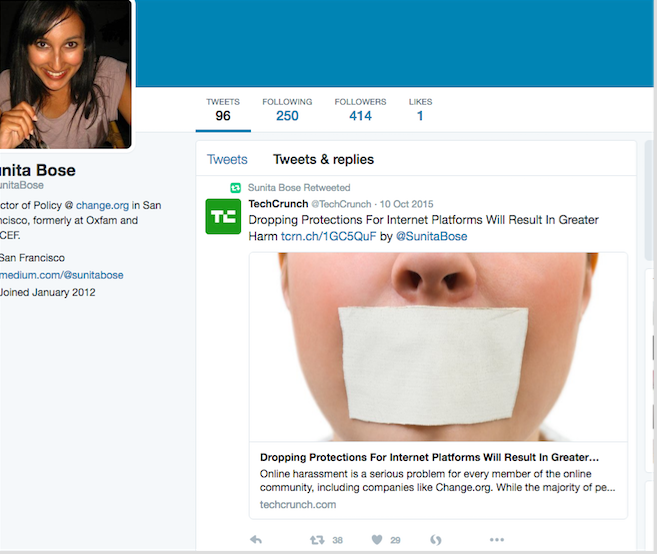 Sunita Bose is a policy director for the petition website change.org. As her avatar photo and profile show, it is easy to purport to fight the evils in this world from the comfort of a middle class restaurant and to condemn those actually faced with the reality of fighting for their rights against powerfull organisations. The duplicity of this view is all the more salient given Change.org‘s propensity for accepting money from right wing organisations that promote hate speech. While it is unsurprising that corporations such as Google profit, with impunity, from the publication of ‘hate speech’ or at least until they are caught, for an organisation that purports to actively support and promote social justice this borders on evil. I sued Google over defamation on the website Ripoff Report, a known Google enabled extortion racket because I had absolutely no other choice! I was dragged through an unmitigated hell in the trial. I went to trial because I wanted to stand up for my rights and those of other victims of cyberbullying. I won and set a global precedent which apparently displeased Bose. She accused me of threatening the freedom of speech rights of ‘real’ victims. I am not sure in which restaurant Bose was dining when she authored her nasty post, but from what I can work out it was either in Sydney or San Francisco – hardly the trenches! The intermediary should generally only be involved if that person is unreachable or anonymous, and they should only have to remove content that is proven to be defamatory. I am aware of the Manila Principles that Bose used as an exemplar of removals from Google to save ‘real’ victims. But I also know the difficulties faced by victims. Even if they can obtain a court order, Google, the search engine with the majority of market share in Australia, will not honour them or only partially remove the content. Clearly, never one to let the facts get in the way of a good soapbox, Bose did not read anything about my case or she would have known that I tried that approach years ago and failed in the court (in 2011) because there was no precedent. The decision was available on a legal database. All she had to do was look! All that victims of cyberbullying want is for it to be stopped. In fact, Change.org promoted a cyberbullying petition which was remarkably popular possibly due to the tragic suicide of a well known Australian. Since I commenced my fight I have helped others obtain removal of content from Google, Facebook, and from websites and hosting services and supported other victims. I have tried to make a difference and succeeded. The Australian Government has done nothing to assist adult victims of cyberbullying. It has been a long battle and I have been close to suicide at times and this was referenced by the trial Justice in his damages judgement. Bose attempted to inflict further humiliation and distress and in that she succeeded. Bose’s diatribe was published when I was exhausted from a long fight. I tried to write a reply but the comments were closed. I remember sobbing in the supermarket when I realised that my reply was not published. Had Bose bothered to do a even a modicum research she would haver known this! In an earlier blog page Bose referred to the impact of online harassment and the approach that change.org apparently takes cyberbullying. Yet, Bose did not contact me before publishing accusations that I threatened free speech of ‘real victims’ on a national website. Bose simply tried to bully me! While I have my opinion of why Bose would try to hurt a victim of cyberbullying to further her agenda and career, I will save it for my book. But it is even more telling that Bose removed links to her article from her Twitter account as soon as the ABC deleted it. 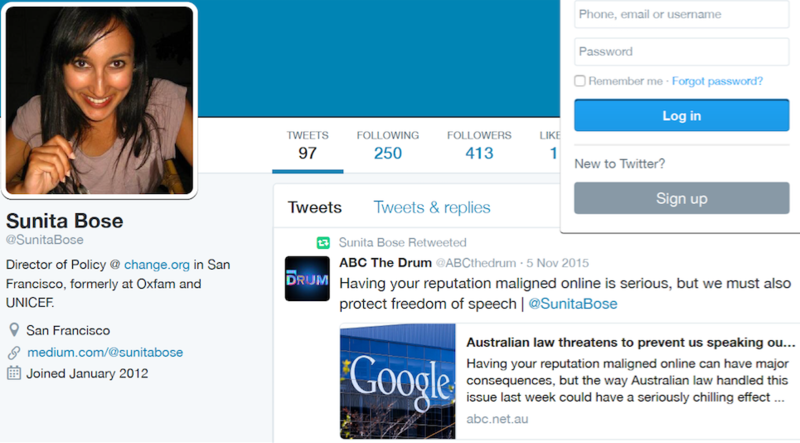 Bose deleted her Twitter references to the article that was removed by the ABC within hours of me tweeting the correction. Clearly, she does not stand by her convictions. But last week’s ruling takes Australia in the wrong direction, and has a seriously chilling effect on freedom of speech. That case returned to court this week and we should be watching closely as it progresses, because it’s crucial that people can use the internet to speak out about injustice. This is not an issue of silencing freedom of speech. This is about protecting the rights of victims from organisations that have the online power to destroy lives. No-one has the right to decide that one group of victims is less important than the other and especially an organisation in a position of power and influence. In her article Bose held change.org as some sort of arbiter of need and injustice! I thought that the majority of the petitions on that website were from individuals trying to change an aspect of injustice in the system and often against powerfull organisational interests. Sunita Bose has proven that she is part of the problem, not the solution! Although it was removed from the ABC website, the article was republished on medium.com by Bose and on Australian blog, conspiracyoz.com. I have added my comments on both and a link to this blog post.